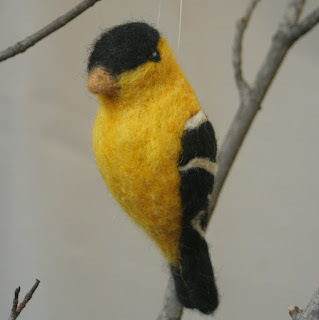 During the winter I hear a lot of goldfinches. I love their little twittery calls as they fly from tree to tree. But I rarely see them, or if I do, I probably think they are someone else. It's amazing to me how they change color. Right now they are dull olivey yellow, but just barely yellow. As the days lengthen, they will get brighter and brighter yellow. It's like magic. And unfortunately, it's only the guys who get to make the transformation. The females stay that olivey yellow all year round. I know it's for their own good, but it just figures that the guys get all the glory! Oh well, I love them anyway. Oh, yes I love them too. Up here in Maine, any colorful bird is a joy to behold. Wow! That bird is magnificent! Nice job!